This was SO interesting to read!! I love how you worked it out. I am learning so much from you. Thank you. Thank YOU, Phyllis. I appreciate your kind words more than you could know. I’m so pleased you have found something which works so well! I just wish I could do the same for the girls. We have started having very relaxed fraction maths, complete with biscuits which we cut up to demonstrate. Funnily enough I never hear a complaint about that! I can’t always fall back on food to teach a mathematical concept else we’ll all be the size of houses! I think the white board might just be one of your best ideas. I like the idea of the girls working one problem at a time, without the fear of lots more to come. Thanks for sharing, it’s always interesting to see how others work! 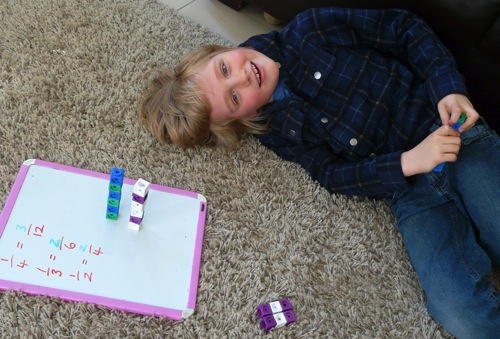 I think whiteboards are our favourite homeschool tool. The postman delivered a pack of new dry wipe markers and a couple of magnetic board rubbers today, and I have been ridiculously happy all day every time I look at them. Is that very sad? Biscuit maths sounds like a splendid idea. I bet you could go right through to calculus and trig with your creativity! Small biscuits? Thanks, Hwee – it’s always a relief to know I’m not the only one! Another idea I will have to keep in mind. I really like seeing the way you individualize learning to keep your students engages. Thanks Carol. 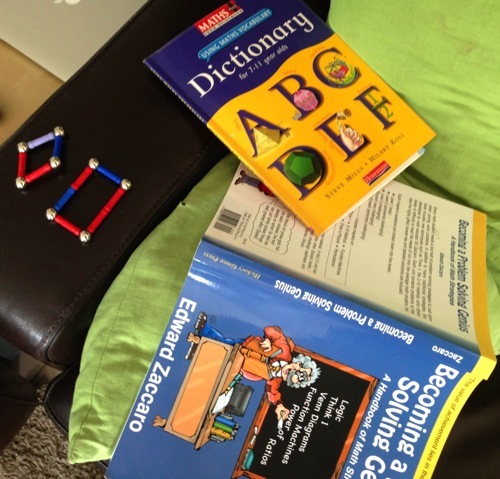 Considering they are only 16 months apart, my kids learn in such different ways. It’s a real pleasure zoning into what makes each of them tick. A book you might want to look into for your autodidact is _A Beginner’s Guide to Constructing the Universe_ subtitled “The Mathematical Archetypes of Nature, Art and Science” by Michael S. Schneider. It’s an everything book that explores the numbers 1 through 10 and their significance from about every possible angle. Although not specifically a curriculum, more like a museum, it could be a year-long study by itself. Thank you so much, Nancy. I’ve just downloaded a copy. I’ve never come across the idea of “sacred geometry” before but it looks fascinating, and right up our street. There is also an “old” PBS series called Life by the Numbers (narrated by Danny Glover) that could be too advanced for your children right now but approaches math from fascinating perspectives. It’s pricey but so good. You might want to check out the book first or the review on Amazon.com. I love the big picture, too, Nancy (definitely a Myers-Briggs intuitor). I see that Keith Devlin consulted on the series – I’ve got his Introduction to Mathematical Thinking (not that I’ve got very far with it so far). I’ll definitely check out the book and YouTube clips of the series. Thanks again – I love hearing about these kind of resources. This was such a lovely post to read and one of the many reasons I love homeschooling. We can really observe our kids and recognize what works and what doesn’t work. No public school teacher will ever have the time to do that. Math is not a favorite around here either. I am going to check out a couple of your resources and some of the resources your commenters mentioned. We are so lucky, aren’t we Karen? I love seeing your photos of Keilee engrossed in one of her passions. You are both such an inspiration. I can relate so much to your words about being a detective. I am doing that all the time, trying to help Gemma-Rose, especially, enjoy and learn maths. Sometimes I have to step very carefully. Like J, she can get very frustrated. The barrier goes up and then she won’t listen. Trust… you have hit the nail on the head! Unless they trust us, they won’t even listen. That trust can be so easy to damage. That’s why I don’t insist Gemma-Rose does things the conventional way even though that would be far simpler for me. She wouldn’t learn anything and the trust between us would disappear. Funny how we are both pondering maths at the moment! Being a detective is fun, isn’t it? Especially when the rewards are so great. I am always glad to be pondering the same subject as you. It’s so interesting chatting with a kindred spirt, especially one with so much unschooling experience! Gosh, it’s been a long, long time since I have visited. Without a computer for 6 months, my blogging mostly stopped…but I have a laptop again! LOL Does this all sound familiar! 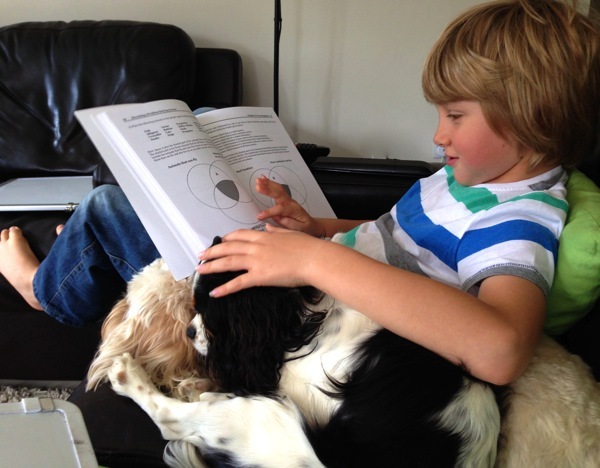 Sam (9) and his SPD…and Math…and games. I’m going to try video instruction (Saxon) next year and see how that goes. He needs structure and rules…and LOTS of repetition. I considered Khan too. Maybe that will be next? or simply books and games? His spatial reasoning is crazy good. Odd how it works out, huh? I’m so pleased you’re back! I can completely relate to all the things you’ve tried with Sam. And it sounds like you now know a lot more about his learning style than you once did. I keep telling myself that’s a good thing with J(9)! The buddy system looks like it is really working for you both. My 9 year old really enjoys maths when I attempt the same exercise as him and he loves it when I get something wrong. You have made me reflect on this and I’m now going to make my involvement a constant part of his maths session. Whiteboards are my absolute favourite homeschooling tool, Prudence! We bought ours in the US (I so wish we had Target and Dollar Tree over here) but I’ve noticed they seem finally to be available at a reasonable price over here. Buddy maths is probably all of our favourite parts of the day (most days, anyway!). What a great post! I have a 7 year old who is extremely suspicious of anything educational – particularly maths. I love your approach and will be looking at the books you’ve been using! Thank you, Lucy! I’m so pleased to have found your blog.